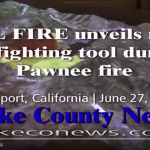 Reporting from Lake County News – Cal Fire officials are using a new tool in the battle to contain the Pawnee fire east of Clearlake Oaks. On Wednesday, at the command center located at the Lake County Fairgrounds in Lakeport, Cal Fire hosted a small gathering to unveil the new firefighting technology. John Heggie, a fire behavior analyst with Cal Fire’s Incident Management Team 3 who led the demonstration, said that to his knowledge this is the first wildfire incident on which the program has been utilized. Among those on hand for the demonstration were Sheriff Brian Martin, Northshore Fire Chief Jay Beristianos and Lakeport Fire Chief Doug Hutchison. “This is a marriage of the science and fire service,” Heggie said, adding it’s a great opportunity to use private sector technology to fight fires. In the video above, Heggie and Cal Fire staff use Simtable to do a 3-D illustration of the Pawnee fire’s progression in its first burning period.